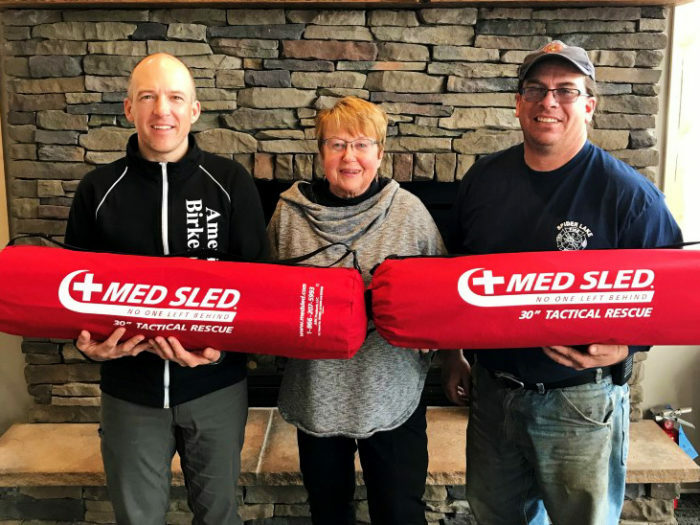 L-R: Ben Popp, American Birkebeiner Ski Foundation, receives two donated Med Sleds from Bobbi Huot, Town of Spider Lake, and Lee Nelson, Fire Chief – Spider Lake Volunteer Fire Department. Hayward, WI, and the surrounding areas are a mecca for silent sports enthusiasts from all over the country, drawing thousands of adventurous spirits to enjoy the trails, lakes and rivers surrounding us. An estimated over 100,000 visitors to the area choose to spend time on the 100+ kilometer long American Birkebeiner (Birkie) Trail system. Both the Birkie Trail and the CAMBA Trails weave in and around the Town of Spider Lake. The Town of Spider Lake Volunteer Fire Department wants to make emergency evacuations easier should someone be injured while skiing, running or biking on the area trail systems. They have generously donated a Med Sled for placement at the American Birkebeiner Ski Foundation’s new Samuel C. Johnson Family Outdoor Center at the Trailhead on Highway OO east of Seeley, WI and in the Town of Spider Lake. The Med Sled is designed to easily pull an injured individual over snow or grass, needing only one able bodied person to do so. While originally designed for alpine ski areas, Med Sleds are frequently used in both cross-country ski and mountain bike trail areas, as well. Bobbi & Pete Huot, residents of the Town of Spider Lake, have also graciously donated an additional Med Sled for placement at the Mandli Boedecker trailside cabin located at the Boedecker Trailhead. The Huots are on a mission to procure enough Med Sleds for each of the trailside cabins on the Birkie Trail for use by skiers, runners, bikers, and hikers, should the need arise.